Can you believe that Thanksgiving is only a week away–Where did the year go!? Although Thanksgiving food is aMAZing, it is also time to prepare yourself for the impending week of turkey leftovers, making these Pizza Pasta Pies a perfect turkey-free, pre-Thanksgiving recipe! These Pizza Pasta Pies are easy to make and great for the whole family (even the picky eaters). Although I have seen pasta pies before, I decided to take it to a new level by adding pizza! 1. Cook your pasta for a few minutes less than the directions recommend (my pasta said cook for 9 and I cooked for 7). Then toss pasta in shredded parmesan cheese and let cool for a few minutes. 2. Once your pasta is cool to the touch, fill your your springform pans with with the noodles placing them vertically. If you don’t have mini springform pans, you can use a large springform pan instead (just cut slices to serve). 3. Heat oven to 375 degrees F, and place springform pans on a baking sheet. 4. Top pies with sauce, using a fork to push the sauce into the holes the best you can, then top with mozzarella cheese. 6. Remove Roll-Ups and pasta pies from the oven. 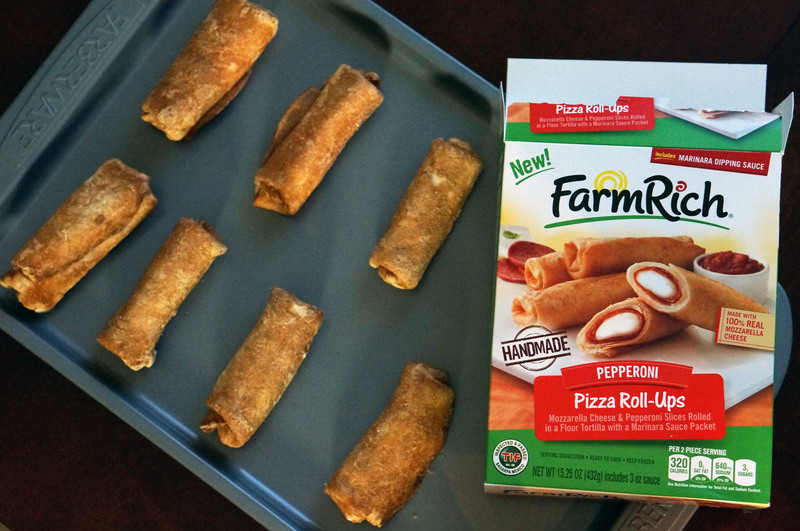 Then, chop up your Farm Rich Pepperoni Pizza Roll-Ups into little pieces. 7. Add more cheese and top with your chopped Roll-Ups. Bake for 5 more minutes. 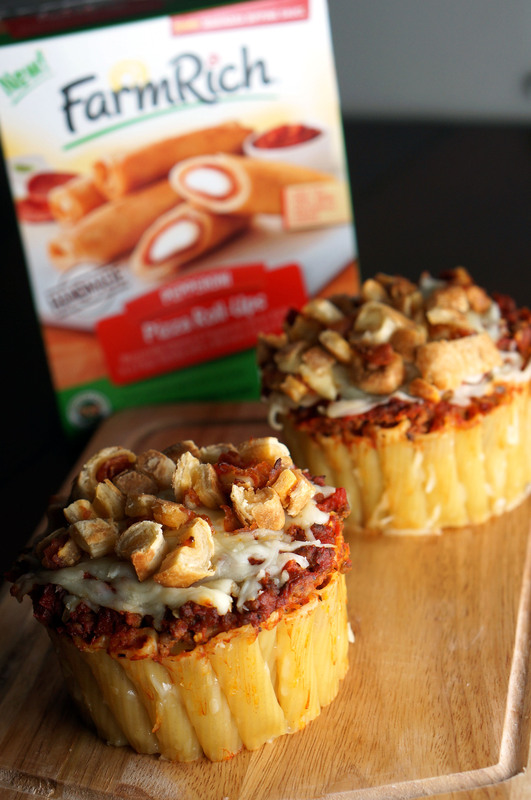 (FYI: These Pizza Roll-Ups taste delicious on top of many pasta recipes. 8. Remove from oven, let cool for a few minutes. Remove springform pan (using gloves if too hot), and serve! Now you will be ready to impress those relatives who visit for Thanksgiving! 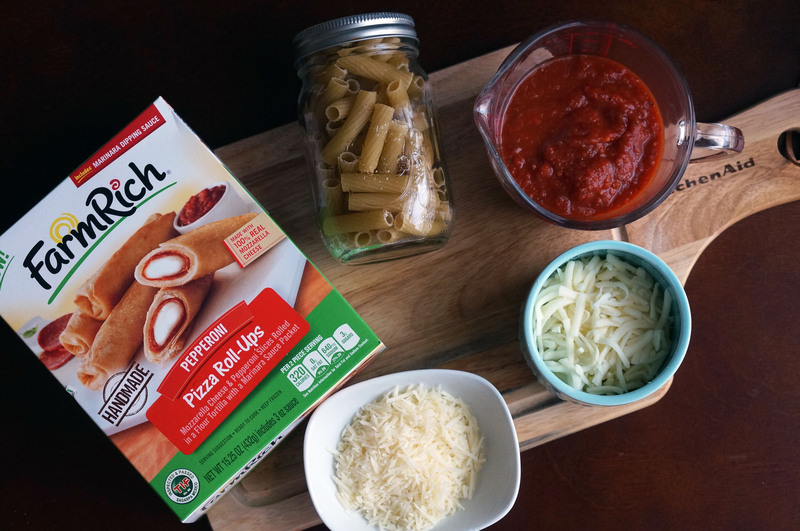 I love how these Pepperoni Pizza Roll-Ups add the perfect crispy topping to this delicious recipe, giving it a little twist compared to your old traditional pasta recipe. Yum! Real-life good. This is a sponsored post from Farm Rich®, but all my opinions are my own. Love pizza, love pasta, these are a perfect match! Look amazing -can’t wait to try them!!!!!! Just love the idea and as you said, great for picky eaters! These will become my “go to” meal! !